On a night of staggered programming, The Bachelor was the top entertainment show with 787,000 viewers -a lift on last Thursday’s 764,000. The TEN show also topped the demos. Home and Away was the second-most watched entertainment show although it was beaten by A Current Affair in its slot. A new-look AFL Footy Show dropped from 529,000 last week to 407,000 this week in 3 cities, but it was still enough to top Seven’s Front Bar on 169,000. In Melbourne Nine’s show was ahead by 135,000. ABC’s Pulse dropped by 24,000 viewers while TEN’s Common Sense continues a downward dive. Great British Railway Journeys will probably top the week for SBS. Nine won Thursday with 29.7% then Seven 25.2%, TEN 19.6%, ABC 16.9% and SBS 8.6%. Nine News was #1 with 999,000 / 963,000 for Nine then A Current Affair (780,000), Hot Seat (508,000 / 279,000), Thursday Night NRL (416,000), The AFL Footy Show (407,000 in 3 cities) and RBT (323,000 in 3 cities). The NRL Footy Show was 155,000 in 2 cities. Seven News (986,000 / 970,000) was best for Seven then Home and Away (674,000), The Chase (619,000 / 410,000), Make You LOL special (457,000) and All Round to Mrs Brown’s (336,000). The Front Bar was 169,000 in 3 cities. 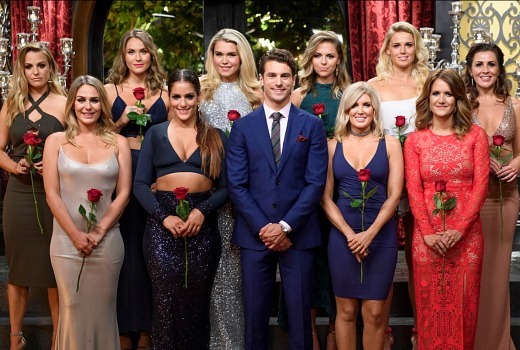 The Bachelor won its slot with 787,000 for TEN followed by The Project (579,000 / 385,000), TEN Eyewitness News (476,000), Family Feud (339,000) and Common Sense (298,000). Law and Order SVU was 178,000. ABC News (738,000), 7:30 (574,000), Pulse (413,000), Short Cuts to Glory: Matt Okine vs Food (356,000) and Catching a Killer (271,000) comprised ABC’s night. On SBS it was Great British Railway Journeys (381,000), Gourmet Farmer (306,000), Michael Mosley: Eat Fast and Live Longer (251,000), SBS World News (168,000), River Cottage Australia (127,000) and Versailles (105,000). Shaun the Sheep bleat out multichannels once more with 258,000. Really enjoying the new season of Gourmet Farmer. What a beautiful part of Australia – such stunning scenery. What a great life he leads. There are a few things that make this year’s Bach more watchable. The girls..they aren’t all fawning over Matty, they’re all a bit more switched on about the genre and its editing, some are there for self promotion, ‘team mean’ are actually great fun, giving the cameras much needed quotes. It’s more about infighting & battling with each other rather than lurve. It’s more random..last night 3 gone and an overnight stay. ..and then there is Jenny, she’s great. Not much common sense in evidence when TEN commissioned Common Sense. What a terrible choppy boring show. Hope they’re not paying too much for this load of offcuts and try hards. Shareholders should be asking some hard questions about TEN’s programming decisions – and Seven’s too! Very poor numbers for Front Bar, even if only screened in 3 cities. Worth noting Perth is 9:40 not 8:30.